Strengthen supports and services for key populations such as undocumented youth, youth with disabilities, and justice system-involved youth. 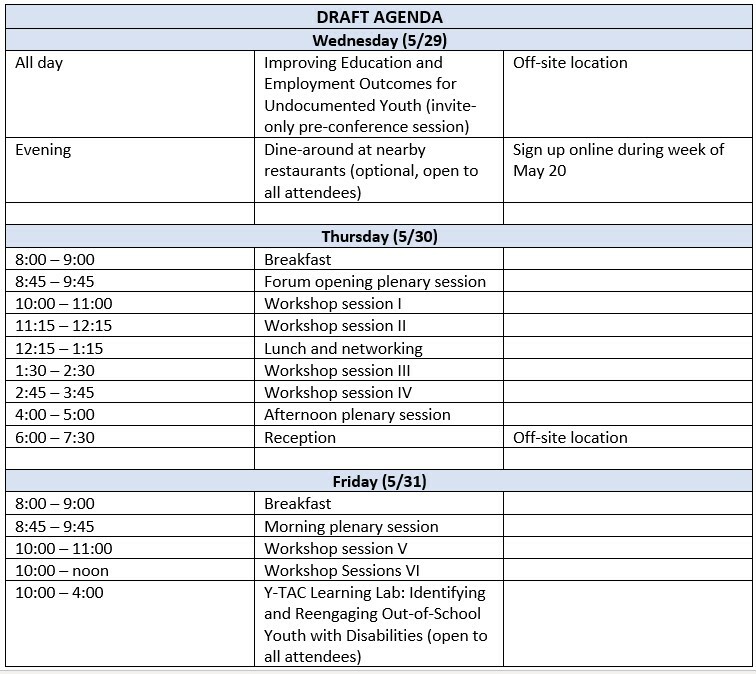 Connections: The Mid-year forum will bring together 100+ participants from throughout the country to share ideas and insights. Come network with directors, practitioners, counselors, policy makers and researchers looking to advance the field. Programming: This convening will heavily emphasize discussion and peer learning, which will take place in the form of sessions, workshops and plenaries on both days. Want an opportunity to expand your leadership and professional skills? Then register today! Advocacy with Underserved Populations: Session focuses will be focused on underserved populations such as gang-involved youth, youth with disabilities and undocumented youth. Do you have thoughts? Want to learn more about collaborating with and serving these populations? Then register today! Session Proposals: Our core team is in the process of reviewing session proposals and will send out a definitive agenda soon. Stay tuned! Please register before April 15th to take advantage of our Early Bird rate of $150 for NYEC members. After April 15th the rate will be $200. NYEC recommends that attendees stay at the following hotels: Washington Inn Hotel, Waterfront Hotel and Z Hotel Jack London Square. Youth leaders (16-24) who register may use the discount code "YOUTH" to receive a $50 discount. If your organization would like to become a sponsor of the Forum, contact Thomas Showalter (thomas.showalter@nyec.org) to learn more about the benefits of sponsorship. Click here to learn about the benefits of sponsorship! What did you find most valuable from the Forum? "Good mix of practitioners, intermediaries, policy experts, etc. from across the country; broad array of workshop topics." "Connecting with colleagues and learning about other models/best practices." "I always love the networking and getting to hear from and engage with people from all over. I also really like the dine arounds." "The opportunity to learn from exemplars from across the country and to have protected time with my team to discuss issues in our specific context." "The sharing of information and resources, as well as results from complex collaborations. Really glad for the ability to go to the deeper questions rather than seeking the easy fixes." "Thank you! I felt it was very well organized for the amount of content delivered, just wish I had had a sense of all the activities earlier (which I know is very hard). I look forward to next year!"